Miranda Culp: I was noting in Net of Being your delight at the propagation of your images in the counterculture, ie tattoos, merchandise. Can you tell me about the relationship between art making and commerce? How do you, as an artist navigate that tension? 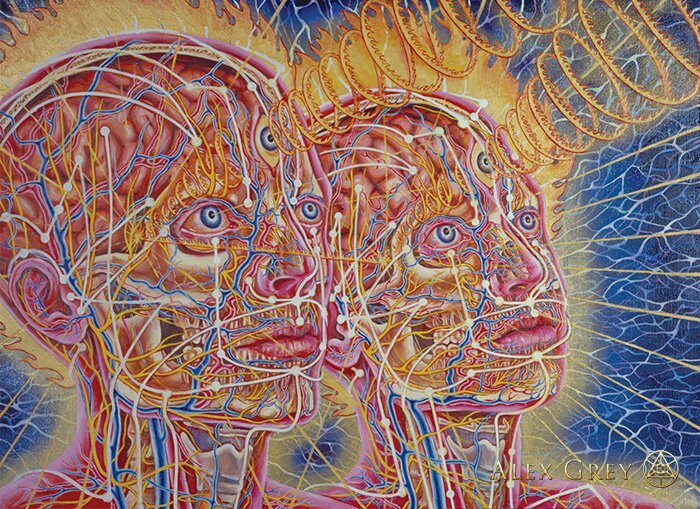 Alex Grey: When visions come, an artist may feel a moral obligation to share the iconography that has been personally meaningful, even sacred to them. 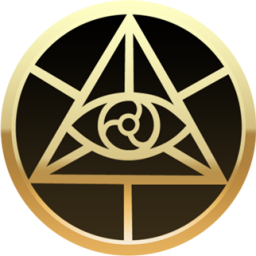 When an artifact transmits this mystic truth, the viewer recognizes and identifies with it as an icon. An effective icon is a sacred mirror that provides a glimpse of the viewers innermost being and imaginal experiences. When an artist gains access to the divine imagination and creates an effective icon representing that experience, the consciousness of a viewer can be transformed to a higher spiritual orientation by contemplating that art. This is the Dharmic principle of Liberation Through Seeing -- to plant a seed of enlightened vision in the mindstream of the viewer. The Orthodox Christians call it Theosis, coming closer to God by meditating on icons. Right livelihood, one of the Eight-Fold Noble Paths of Buddhism, means doing a job for which you are not ashamed, a job that supports yourself and society. People have asked for reproductions of my artwork so we make them available. All proceeds from all sales of merchandise go toward building Entheon, a sanctuary of visionary art at CoSM, Chapel of Sacred Mirrors. Everybody that buys stuff is a builder with us. Buy the poster, get the world view. Get the tattoo, embody the message. We don't think of it as counterculture, but more as visionary and underground culture, like the mycelial web of creative intelligence alive at music festivals throughout the world. Miranda: In a small town with a very young art scene, making art for a living is like winning the lottery. Do you have any advice for our local artists in finding a balance between art and making a living? Alex: Stay as close as you can to what you love. The most important thing for an artist is to find their subject, the thing they make art about, that keeps them hooked on creation. Then it doesn't particularly matter whether you sell it or not, you are doing what needs to be done on a Soul level. Solitude and deep reflection for years is necessary sometimes. This is why we think of art as a spiritual calling, you don't really get into it for the money. Make art events happen and attend those organized by others. Be a strong artist community and make offerings to the greater community and they will support you. Use the internet to make more friends. In any business or endeavor, make more friends and share your most inspiring work. Make art everyday if you want to make a living at it. Keep a sketch book. Read Think and Grow Rich. Zena summarized How to Be a Great Artist by creating a small book when she was five. "Do Your Best. Be Yourself. Never Give Up." If your art is your uncompromising best work, if the work represents you authentically and without pretense and you practice art-making daily for a lifetime, continually sharing that artwork fully and inspiringly, your work will touch others and support you no matter where you live. Miranda: You and Allyson have traveled all over the world. Can you tell me about other cultural approaches to art making that have made an impression on you? Alex: We have been particularly drawn to the world's holy places because we are called to build one. A sacred site puts a philosophical framework around a sacred artifact. A gallery offers a sales environment. Art in a museum offers an anthropological, archeological context, classifies and educates, giving historical perspective. A site created to honor the divine provides a protective boundary around mystic art that represents the core teaching of the faith of that sacred place. Excellence exists in every art form in every corner of the planet. 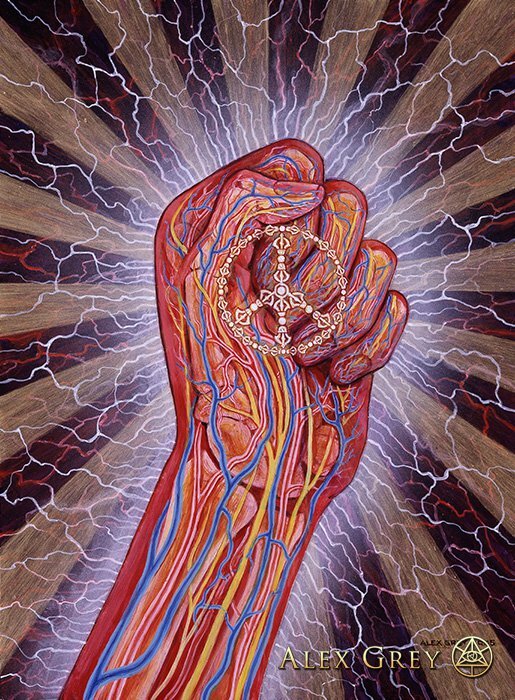 Worldwide, we meet visionary artists depicting their experiences in a new kind of sacred art that portrays their personal visions of the divine. Miranda: In the book you say: “art is the opposite of war.” I think it’s safe to say that most of us feel powerless in the face of war and that this modern era presents an increasingly efficient, global war machine. As a result humanity feels more fragmented and separate. What does the future of humanity look like to you? Alex: In the future we propose everyone is an artist of their life, a creative node in a unified earth citizens brigade that saves the precious life web, share our gifts and emphasize what unites people rather than what divides. Finding unity and discovering the gift of life, no matter what the current conditions, is a sacred path. Miranda: I want to thank you and Allyson personally, not only for the beauty of your work, but also for the dedication and the intention behind it. As William Burroughs said in his last journal entry: More Light!